Anyone with a baby could probably tell you some horror stories about what their car seat has been through. It seems that the one thing all children have in common is their ability to make a giant mess. This means that knowing how to clean your baby car seat is extremely valuable. While all car seats have specific care instructions, the bare bones of all car seats are essentially the same. One thing to remember regardless of your particular car seat is how your seat reassembles after cleaning. Another thing to keep in mind is that it is good to use a gentle cleanser on the seat. Harsher cleaners could lead to skin irritations for the baby. It is also in your own interest to clean the seat as soon as a mess occurs. If a spill sits on the fabric for too long, it could lead to a difficult clean up or permanent damage. If you are cleaning your seat as part of routine maintenance, then the timeframe is less urgent. It is better, however, to keep your seat in clean condition to prevent the spread of germs. As mentioned above, a gentle soap is your best option for car seat cleaning. To prevent skin irritation, the safest option is a baby shampoo or wash like Johnson’s baby products. Since these soaps are made for little ones, there is not a huge risk of negative reactions. In addition to the soap, baby wipes can come in handy as well. They can be used to remove the biggest amounts of mess in a relatively easy manner. Plus, most are disinfectant, so you will be taking out some of the germs at the same time. Soft rags can also be used to clean up the biggest messes and then simply be thrown into the washing machine at the end of the day. Terry cloth rags are often a good bet as it is abrasive enough to cut through any stuck-on grime, but soft enough not to scratch the plastic. If you are doing more of a maintenance cleaning job, a vacuum cleaner may also be helpful. This way you can get all the loose crumbs off the seat without dirtying your rags or wasting baby wipes. Finally, perhaps the most important tool, is warm water. With the most delicate parts of the car seat – the buckles and straps – warm water will be much safer than soap or wipes. 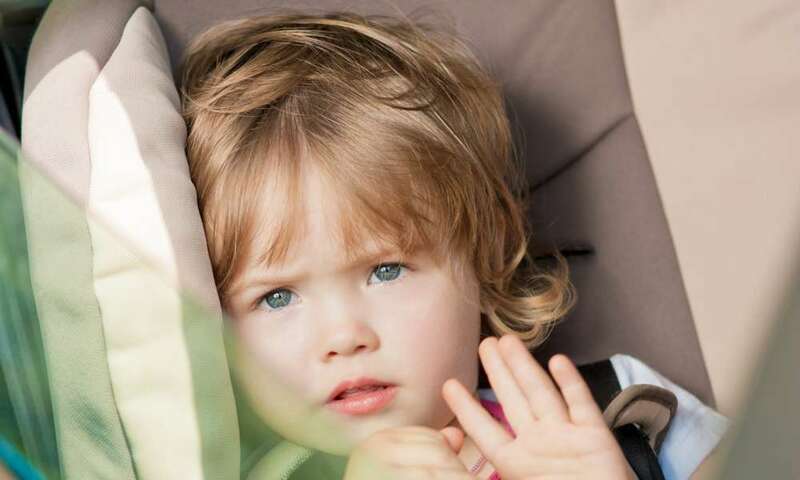 The first step in cleaning a car seat is uninstalling the car seat from the vehicle for easy cleaning. The next step is removing all the removable padding. To be safe, read your specific baby car seat car instructions for how to clean the fabric pieces. Most fabric pieces of a car seat can be washed on the delicate cycle of a washing machine with cold water. If your car seat says not to do that, however, simply use the baby wipes, rags, and warm water to clean the cushions to the best of your ability. The straps and buckles are easily the most delicate part of the entire car seat when it comes to cleaning. Makes sure to double check your care instructions for your specific seat when it comes to these pieces. Unless your care instructions say something different, the first step is to gently wipe down the straps with a damp rag. Be careful not to get the straps wet fully as this will mess up some of the safety features of the webbing. Next, get a cup that fits your buckle completely inside and fill it half full with warm water. Then, carefully submerge the buckle into the water and move it around to dislodge any grime. Make sure the webbing part of the harness stays out of the water. Pull the buckle out of the water and carefully dry it with a towel. Then, to let the whole harness dry, remove it from the seat (if possible), and lay it flat in the sun to dry. Cleaning the base and frame of the car seat is the simplest part in the process. There usually are not many brand specific cleaning guidelines for the plastic portions of the seat. It is always better, though, to double check rather than ruining a car seat. If you are cleaning up a dry mess, this would be the time for the vacuum cleaner to come into play. Use the vacuum to pick up any crumbs and dust from the seat base. The brush attachment is probably the best option as it distributes the suction better. If the harness was not removable, make sure it is lifted out of the way to avoid damaging it. The seat will never be submerged and the soap will be mild, so if the harness gets cleaner on it, it is probably not going to be the end of the world though. Using the wipes, rags, soap, and water, go over the entirety of the remaining pieces to clean each one. Because most remaining pieces are plastic, you can scrub a bit harder to get off any remaining grime. When you are done, wipe down the seat with a damp rag and a dry rag to ensure all the soap residue has been cleaned off. The reassembly of the baby car seat is largely based on your specific car seat. Generally you should start with the last thing you removed, add it back on, and move on to the second to last, etc. Depending on the complexity of the seat, cleaning your baby car seat can be time consuming. As you plan to clean your car seat, make sure you start when you do not have to use the car seat immediately that day. Additionally, if there is any discrepancy between the step-by-step method and the specific care directions for your car seat, defer to the manufacturer. This method will be fairly universal for all baby car seats and should leave you with a sparkling clear seat.